Gina Southgate's name will be familiar to many musicians and listeners of jazz and improvised music in the UK. If it's not, it should be. 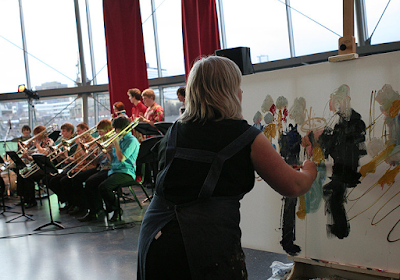 As the artist in residence at Jazz in the Round as well as many festivals, Gina paints while musicians perform live. I work with the frisson of the music observing the relationship between the musician and instrument. I try to capture the energy and essence of the gig in the real time. Sometimes I work solely with sound and ignore the visual content producing abstract imagery. In performance situations I use my materials and surfaces sonically. From now until June 25th, an exhibition of her work will run at the Dennis Kilgallon Gallery in Northumberland. The gallery is located in a scenic location, providing the ideal excuse for an afternoon of fresh air and art. If you'd like to find out more about Gina and see examples of her work, visit the Gina Southgate website.